Safety. The condition of being safe from undergoing or causing hurt, injury or loss. To protect against failure, breakage or accident. Safety Container. As defined by NFPA 30, an approved container of not more than a 5 gallon (18.9L) capacity having a spring-closing lid and spout cover and designed so that it safely relieves internal pressure when subjected to fire exposure. Safety Glasses. A type of glass or plastic lens that will not shatter when broken or compromised. Sapling. A small diameter tree under 4 inches DBH. Sapwood. The outer layers of wood which, in the growing tree, contain living cells and reserve material. Sawyer. A person employed in limbing, bucking and falling trees in non-complex situations. School-Marm. 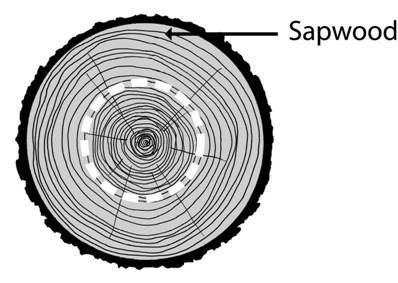 Natural dividing of a tree or log into two or more sections, and/or division of its top into two or more sections. Side Bind. One of the five basic tree positions commonly encountered while bucking. 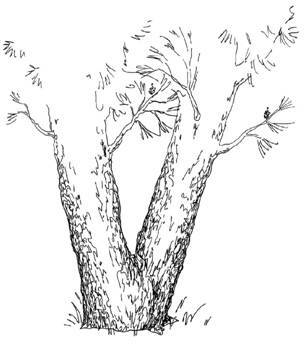 A tree in a side bind situation is compressed on one side and tensioned on the other. Side-Boring Backcut. 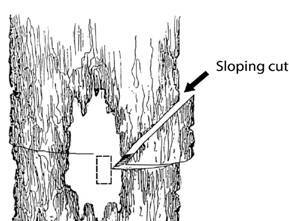 Side-boring is a technique for establishing the amount of holding wood required to fall a tree. 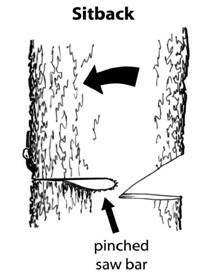 The guide bar tip is plunged into the tree behind the hinge wood above the undercut (face) to establish the back cut. Side Lean. Side lean is the lean determined from the intended felling direction. Side-Notching Backcut. Intentional alteration of the standard backcutting procedure to prevent loss of control and/or barber-chairing. This advanced skill method reduces the amount of holding wood remaining to be cut by cutting each side prior to the final across-the-back severing. Sit-Back. 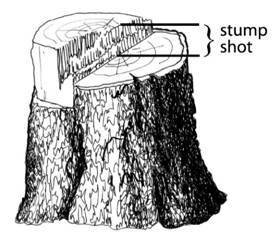 Refers to a tree that settles back on the stump closing the kerf of the backcut. Generally a result of improper determination of the tree's forward lean and/or of wind, failure to place a wedge in the backcut. Slabbing. Often caused by improper technique and/or sequence of bucking cuts which result in a lateral split of a log. Slashing. The cutting and piling of small diameter young trees or brush. Slope. The increase or decrease in altitude over a horizontal distance expressed in percentage. Sloping Undercut (face) Cut. The second of the two cuts required to undercut (face) a tree. It must be angled sufficiently to allow a wide-mouthed undercut (45°) opening. Snag. Any standing dead tree or remaining standing portion thereof. Sound. Descriptor used in tree felling, especially snags, in reference to the presence of rot in the standing tree. Sounding. Using the head of the falling axe to strike the tree to determine its soundness. Spike Top. Live tree that has a dead barkless top. Spring Pole. 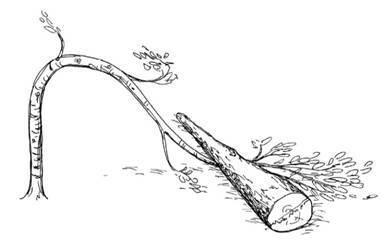 A limb or sapling that is bent under a fallen tree. Usually under great amounts of pressure (tension) and is considered potentially dangerous until correctly relieved. Staub. A short length of cut branch wood extending from the bole or the ground. Staubs create tripping and injury hazards. Strip. Area allotted to each sawyer or faller. Typically used in interior logging and leap-frogging fireline saw teams. Stump Shot. The height difference between the horizontal cut of the undercut (face, or notch) and the backcut. 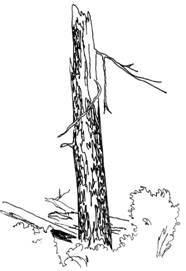 The difference in height establishes an anti-kick back step that will prevent a tree from jumping back over the stump toward the faller. It is the facecut side of the holding wood. Swamper (or puller). Assistant to saw operator who carries fuel and tools, also engaged to move cut material such as brush or other objects. Swamp Out. To clean out brush and other material around the base of trees and where trees are to be bucked prior to felling or bucking as protection against saw kickback and to provide safe footing and escape routes.